Drop-dead delicious. 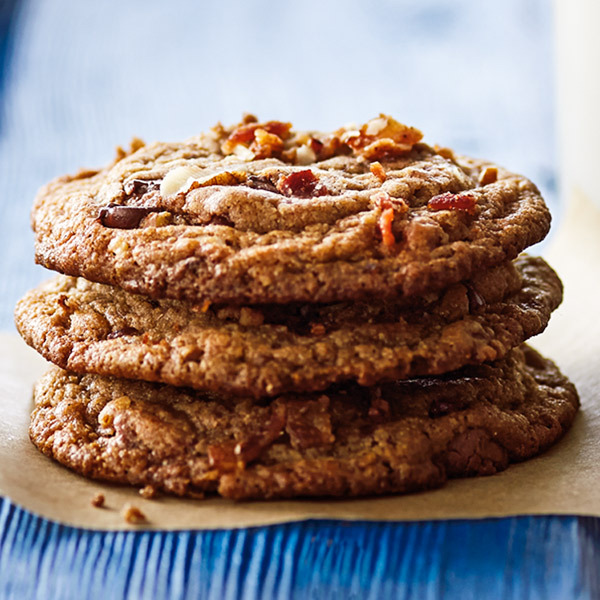 Crispy bacon and toasted pecan pieces help our already amazing chocolate chip cookie recipe boldly go to the next dessert level, providing a depth of flavor entirely unexpected in everyone's favorite go-to cookie. Mix up a batch of these sweet and smoky Bacon-Chocolate Chip Cookies for Father's Day—or any day! Combine flour, baking soda and salt. Beat butter, granulated sugar, brown sugar and vanilla in large mixer bowl until creamy. Add eggs, 1 at a time, beating well after each. Gradually mix in flour mixture. Stir in both kinds of chocolate chips, bacon and pecan pieces. Drop rounded tablespoons of dough onto baking sheets lined with parchment paper. Bake 9 to 11 minutes. Cool cookies on baking sheets for 2 minutes. Then transfer to racks to cool completely.